Comments: One of sixteen species in this genus that occur in North America north of Mexico (Love and Walker, 1979), four of which have been recorded in North Carolina. 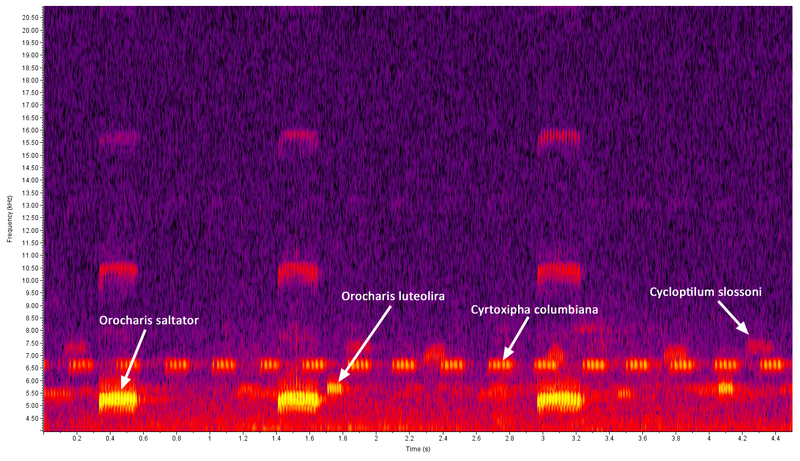 Slossoni belongs to the Slossoni Species Group (the Complex Chirping Scaly Crickets), which includes two additional species, neither of which occurs in North Carolina. Species Status: This species was historically treated as C. antillarum, a species that Love and Walker (1979) identified as a strictly West Indies species; all North American specimens previously included under antillarum (e.g., Blatchley, 1920; Fulton, 1932) were moved to slossoni, which had previously been considered a synonym of antillarum. Comments: A very small (but larger than trigonipalpum), reddish to brownish Scaly Cricket. The cuticle of the pronotum is yellowish-brown with a reddish cast; that of the abdomen is dark brown to blackish. The scales covering the body are gray-brown (Love and Walker, 1979). Cycloptilum trigonipalpum is very similar in appearance and is best distinguished using structural features (described below), as are members of the Bidens Complex. Structural Features: As in other Scaly Crickets, the cerci are long and fairly thick, hindwings are absent (the tegmina as well in the females), and the pronotum is elongated -- in males of this species as well as trigonipalpum, it usually completely covers the tegmina, unlike the case in the Bidens Complex. In the Slossoni Species Group, the terminal segment of the palpus is only weakly expanded and the end only moderately oblique, with the shortest side greater than half as long as the longest side. The internal male reproductive structures are distinctive (see Love and Walker, 1979 for a detailed description). 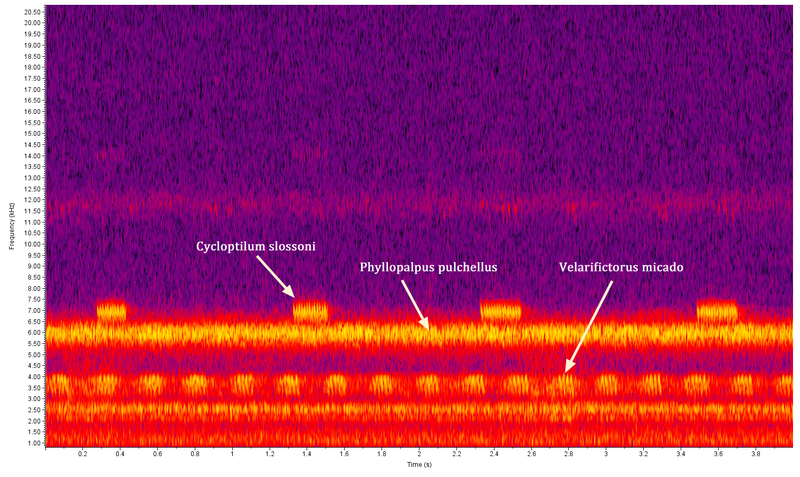 Singing Behavior: Songs of this species consist of short, buzzy trills (or long chirps); in North Carolina, Fulton (1932) noted that the trills of slossoni (=antillarum) are usually given in a series of 3-4 and at a rate of 1.4 to 1.6 trills per second. Love and Walker (1979) observed each trill to consist of about 15-25 pulses; within each trill, a single syllable is often given first, followed by a series of somewhat paired pulses, which gives them a somewhat buzzier quality than the trills of trigonipalpum. Capinera et al. (2004) give the dominant frequency as 6.9 kHz at 77 F (25 C). Habitats: Love and Walker (1979) described this species as occurring in shrubs and low trees in woodland and scrub habitats in natural communities in the Coastal Plain, but also including ornamental plants in residential neighborhoods. One recent record from New Hanover County comes from a natural stand of Maritime Swamp Forest, but three others -- from Carteret and Wake Counties -- come from residential areas with planted vegetation. One recent record from Orange County comes from a parking lot with median areas planted with ornamental shrubs. Adult Phenology: Recent records come from mid-August to late September; Brimley (1938) also mentions one record from July. Comments: This species was unknown outside the southeastern corner of North Carolina until recently. Fulton (1932) described it (as C. antillarum) as occurring along the Coast and did not include it in his list of species from the vicinity of Raleigh (Fulton, 1951). Brimley (1938, possibly based on Fulton's records) only includes New Hanover, Columbus, and Bladen Counties. As in the case of Orocharis luteolira, which was similarly once known only from the Coastal Plain, this species may have been either overlooked or may be spreading northward and westward, possibly as a result of climate change. While we still have only a handful of records, the use of ornamental vegetation growing in residential neighborhoods suggests that it has a fairly wide habitat tolerance, which would appear to make it relatively secure within the state. 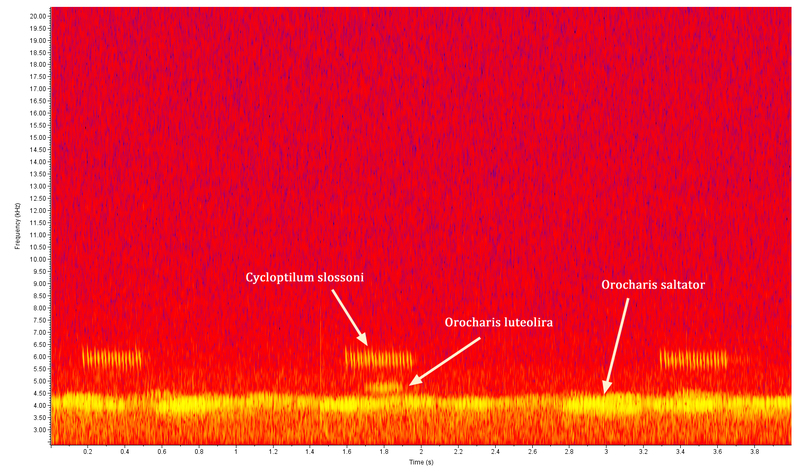 Comment: Heard singing higher in trees than the two Orocharis species that were recorded at the same time. The temperature was ~ 63 F at 7:49 pm. Pulse rate was 20 pulses per trill (= 51/sec within trill).